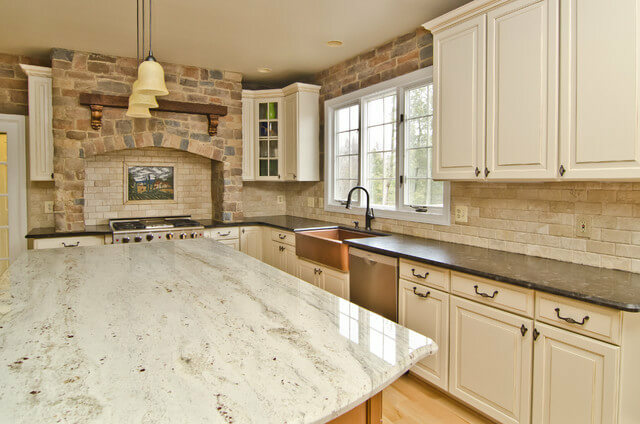 You’ve done your research and have selected granite as your finish of choice for your new kitchen countertops. The exciting part is, you’re not limited simply to your choice of material to refresh your space. There are a variety of design considerations as well as color combinations to consider to ensure that your new kitchen is going to be a space that you will love. We can help you to identify some design options that reflects your tastes but is also unique to your home. The choice is yours – do you want to explore simply subtle and functional or are you going for the “wow” factor? We are not limited to simply countertops which run along the perimeter of the room anymore, and some of these new design concepts can really help to create an interactive space in your kitchen that will bring your family together. If you plan for your granite countertop to double as a breakfast bar, you may consider a tiered countertop that creates a separation from the functional food preparation area and the surface where people will be eating. This may be especially useful to create a space that is welcoming for your children to complete homework assignments, or for you and your spouse to work on projects at the counter amid the activity of the kitchen. AS you plan for your new kitchen, consider the development of a functional island. While traditional designs have the usable counter space and sinks at the perimeter so you’re facing away from everyone in the room while working at your food preparation tasks, an island with working counter space and a sink may bring you face to face with others in the room and create a more interactive atmosphere in the room. Have You Considered Your Color Palette? Colors and contrast play a significant role in the mood and atmosphere that you create for your kitchen. As you consider the feeling that you hope to create in this room, here are a few common color combinations that are popular with Edmonton homeowners. Emphasize depth and dimension. Darker granite with white cabinetry helps to create depth and dimension in your kitchen, allowing the cabinets to appear more discreet, but emphasizing the living space and working area in the room. Creating an accent. Selecting a hue of granite that is similar to your cabinetry for the perimeter counter surfaces, while choosing a darker, bolder color for the countertop surface of the island can create a focal point in the room that draws your attention and brings the room together. Consider the room as a whole. Don’t just fixate on the color contrast between your cabinets and your countertops, but stand back and consider the room as a whole. How does your flooring, walls, window coverings, light fixtures, cabinets, appliances, and countertops all come together to create a room? That whole design impacts the ambience of your space. Even if you prefer simple. Many homeowners have elected to install white cabinets with white granite countertops to maintain a crisp, clean and simple design. However, simple doesn’t have to be boring. The installation of a contrasting backsplash – even in a light gray can create a different twist that gives your kitchen a unique feel. When you’re ready to explore your options and ensure that your kitchen features the function and design that you will love for life, drop in and see us in Edmonton. We are ready to put our experience to work for you.